I am writing this blog post with a sore throat having been shouting so loudly at the television watching Mo Farah become a double gold medallist. Overall, today has been a great Olympic day for me. Despite bidding unsuccessfully for loads of tickets for major events at London 2012, I have managed to see three sports live over the past couple of weeks: Beach Volleyball (see my previous post); the women’s freestyle wrestling final; and, today, the men’s 50km walk (which I did not need tickets for). I could probably write on a postage stamp what I knew about the three sports combined before the Olympics, but I have thoroughly enjoyed all three experiences. The 2km course (to be circuited 25 times!) could not really be more iconic: the men wiggled their way up and down the Mall and Constitution Hill by Green Park with Buckingham Palace and the golden Victoria Memorial (above) right in the middle. I didn’t get a great shot of the winner of the race, but that is largely because I didn’t know he was going to win the race. Kirdyapkin, seen here (above) to the right of two of his compatriots, walked an incredibly clever and great race. He pushed ahead at just the right time and was rewarded with a gold medal and a new Olympic Record under his belt. Despite being 177cm (5’10”) – only slightly shorter than me – this athlete only weighs 54kg (119 pounds or 8.5 stone) – which is very much more than ‘slightly’ lighter than me! 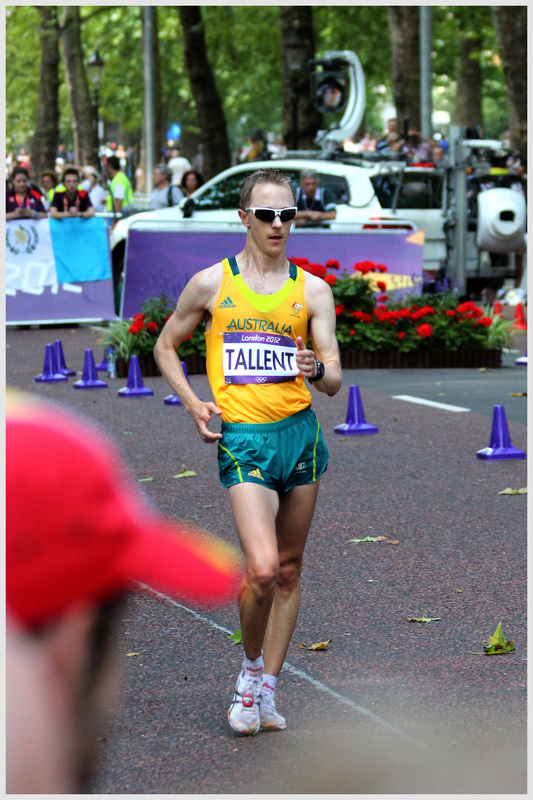 Tallent got silver again to match his medal from Beijing four years ago. Si was leading for much of the race, but if you look behind him, you can just see the blurred figure of Kirdyapkin with him firmly in his sights. 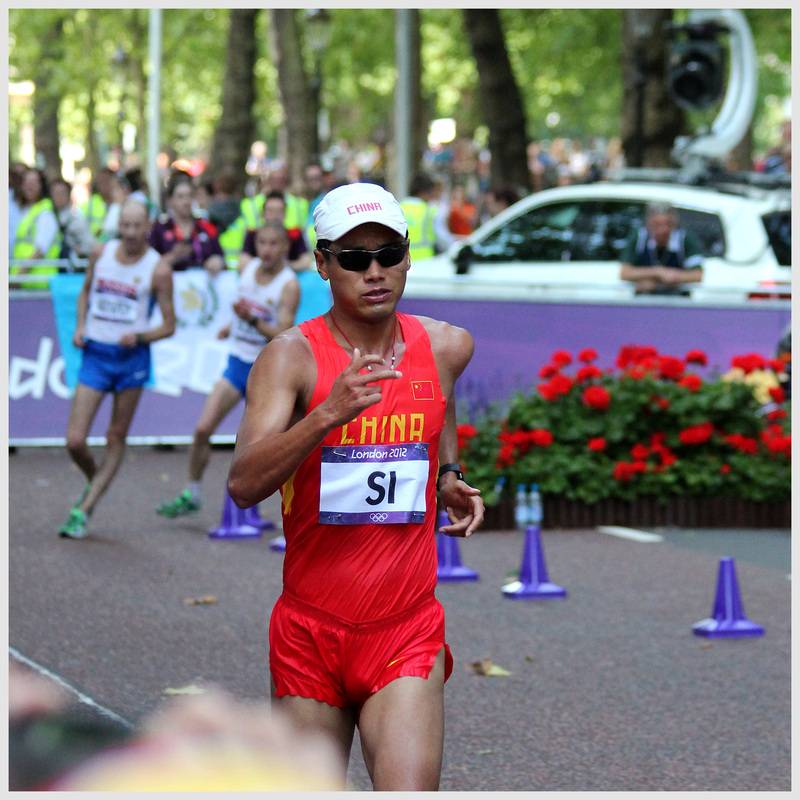 I have stepped down off the podium to include the fourth placed race walker as that is always the hardest of positions to finish – just missing out on a medal. 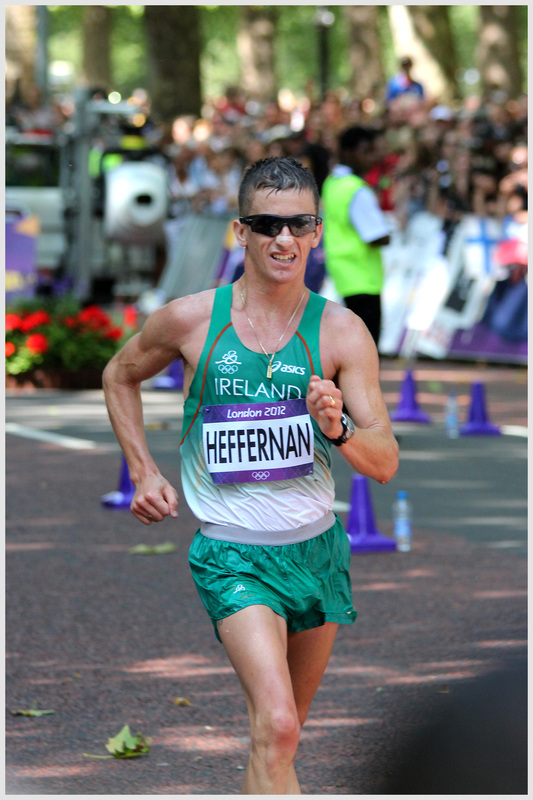 I also wanted to include Rob Herffernan as there was incredible Irish support out lining the route today. 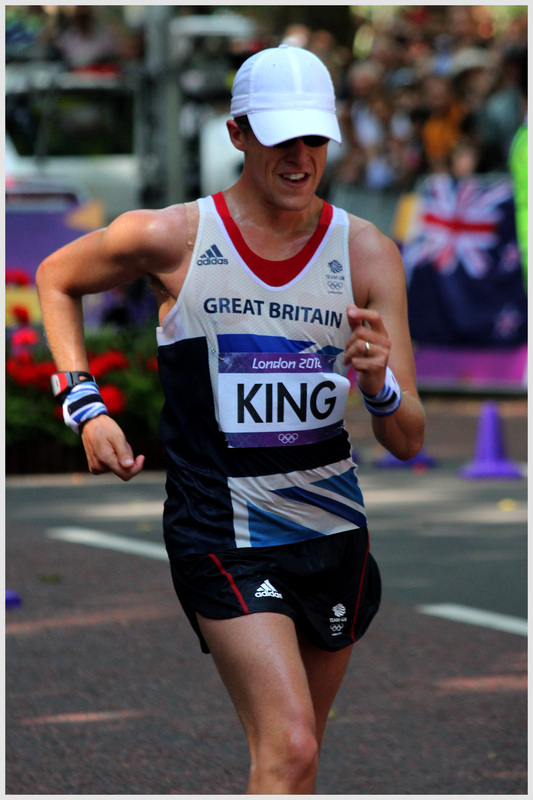 Up and down the course, there was tremendous support for the local lad, Dominic King. Unfortunately, Dominic was nowhere near the leaders and was not going to get a good time. But, then, something special happened. No… he didn’t break the rules and start running. Instead he used his last lap to to thank all of his supporters. He spent his last lap high-fiving and enjoying the Olympic experience in his own capital city. He finished 51 out of 51 finishers, but he had a fantastic time and so did the crowd. 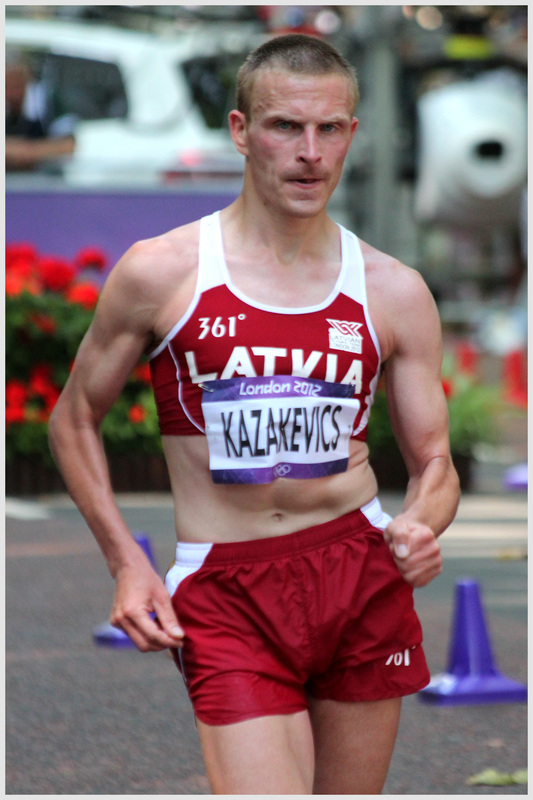 This chap is Igors Kazakevics from Latvia. He finished in 45th place. Now, I may be old fashioned, but I am afraid I see absolutely no excuse for a man to a wear a crop top. 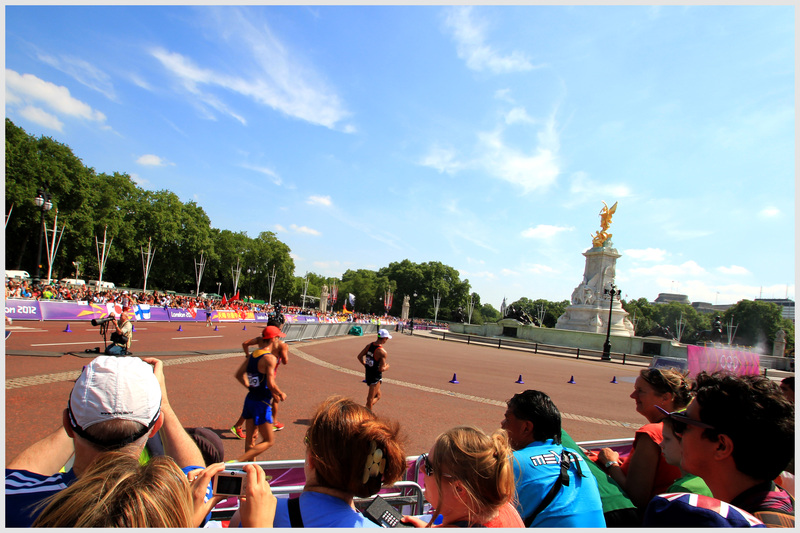 This entry was posted in London, photography and tagged 50km walk race, Buckingham Palace, London 2012, Olympics on August 11, 2012 by iago80. More great Olympics action shots. Am sad to say I missed this curious event. 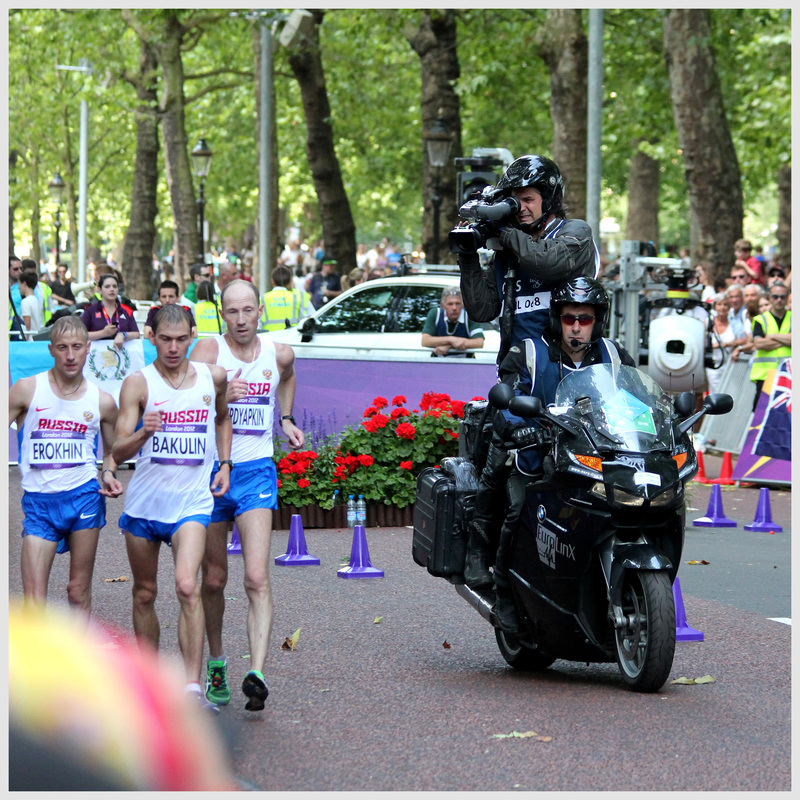 But also shouted at the TV for Mo Farah’s 5,000m victory. Pure gold in every sense.